Welcome to the newly renovated Embassy Suites Colorado Springs hotel. 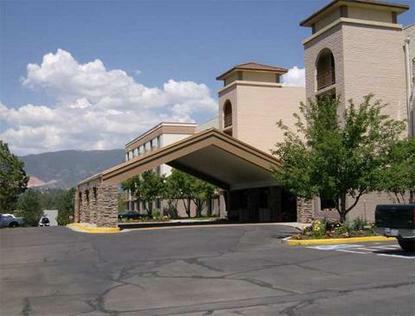 Our hotel is conveniently located just minutes from many businesses and local attractions. Close by are the U.S. Air Force Academy and U.S. Olympic Training Facility. Also nearby the Embassy Suites Colorado Springs hotel are: Pike's Peak Highway and the Famous Hill Climb Event, High Tech Corporations, The North Pole - Home of Santa's Workshop, White Water Rafting, Rock Climbing, Snow Skiing, Horseback Riding, Fishing, Hiking Trails.Guests of the Embassy Suites Colorado Springs hotel will enjoy our famous fully cooked-to-order breakfast (see our interactive site www.myomelet.com) as well as our nightly Manager's Reception. Here are more activities for your consideration to enjoy when you stay with us: Garden of the Gods, Ghost Town Museum, Van Briggle Art Pottery, Seven Falls, Sky Sox Stadium, World Figure Skating Museum, Fallen Fire Fighter Memorial, Cheyenne Mountain Zoo, Pioneer Museum, Royal Gorge Bridge, Flying W Ranch, Pro Rodeo Hall of Fame, Pine Creek Golf.Please click the accommodations link above to see all the amenities available to you while you stay at the Embassy Suites Colorado Springs hotel. The minimum age requirement to book a room is 21 years of age.